Thanks to everyone who entered our giveaway for the fab “Get to Know Alamo” prize pack. The winner is…Marcia G.! Remember, even if you didn’t win, you’re still entitled to an additional 10% discount on any Alamo rental, just for joining the “Alamo Insiders” program. Seriously, that’s like free money! A “Get to Know Alamo” Giveaway! I spend an inordinate amount of time planning the GBOGH family’s travel, and while I love doing it, I’m always looking for ways to simplify the process! Alamo recently contacted me about its revamped website, and I’m now a fan of its new features, such as the Alamo Deal RetrieverSM tool, and the Alamo Insiders loyalty program. And – woo hoo – Alamo is working with us this week to give away a BIG prize pack to help spread the word! When Alamo – part of the world’s largest car rental network — re-launched its website, it added the Alamo Deal Retriever system so you can find the best Alamo car rental deal with one click. It searches all valid Alamo deals and coupons on the web to find the best rates to meet your specific needs. Thanks to everyone who entered our giveaway for Michelin guides from Michelin Travel and Lifestyle! Pat, Shaun, Joe, Paulina, and AdventureBee! I’ll be emailing you all to get your addresses. Happy Travels! Call me “old school” – you wouldn’t be the first – but I love researching destinations with travel guides. Actual books that you can hold in your hands, thumbing back and forth between the chapters on food, hotels, shopping…and back to food. I love their portability for those times when I’m waiting for my offspring at the dance studio/orthodontist/guitar lesson. Do you use travel guides? Would you like to win one? Might be a nice holiday gift for someone, if you’re willing to give it away! 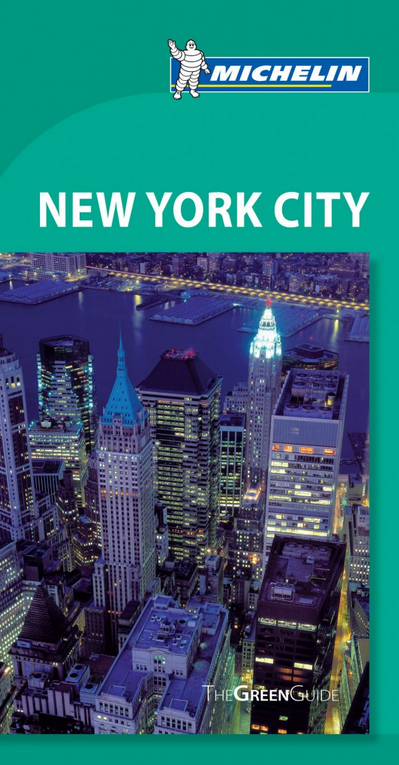 Each guide offers detailed maps, suggested driving tours, full-color photos, illustrations and plenty of new content covering shopping, hotels, attractions, landmarks and neighborhoods. And of course, food! Common among them is Michelin’s famed star-rating system. Why I like them: they’re compact, and can be easily carried with you while you travel. Plus, they contain GBOGH-approved sites like Gatorland in Orlando, the Mapparium in Boston, and the Carnegie Museum of Natural History in Pittsburgh. Enter by telling us in the comments below which guide you would like to win. And I would be very curious to know why you chose it…just because I’m nosy. By entering your name below you agree to the Official Rules of this giveaway. Our winner for each prize will be notified on or before Thursday, December 13th, and will be asked to provide a mailing address. Guides — which are in English — can be shipped to any U.S. or international address, although international shipping will take at least two weeks. No purchase necessary. You must be 18 or older to enter. The number of eligible entries received determines the odds of winning. Winners’ names will be randomly selected using Randomized.com. All prizes will be awarded. Void where prohibited by law. Hooray! We made the list! 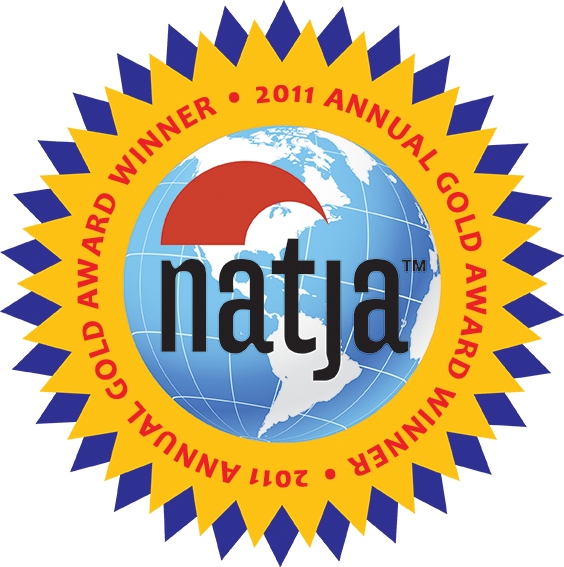 Please vote for GBOGH on this “Best Travel Blog” poll! BIG news! Go BIG or Go Home made Christopher Elliott’s list of finalists for “Best Travel Blogs!” We would appreciate your vote! It’s a quick and painless, one-click process on his website, linked here. We appreciate any and all votes from your PC or smartphone. PHOTO FRIDAY — Gettin’ tricky with it! We love trying to take trick photos like this, and so much of what we see — like BIG roadside attractions — work perfectly! We re-visited the Unisphere a few weeks ago in Queens (NY). 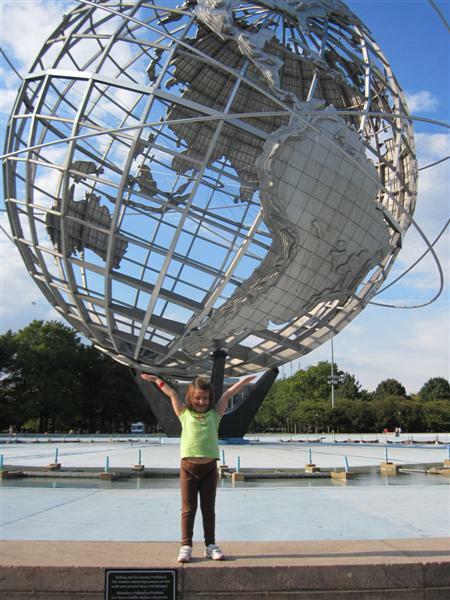 At 140 feet, it’s the world’s largest globe, but yet…nothing The Girl can’t handle! Do you have a great trick photo you would like to share with us? (Come on, we know you tried to hold up the Leaning Tower of Pisa!) Next week, in honor of Halloween, we’re choosing tricks instead of treats. We’ll show you our favorite trick photos…and we hope you’ll let us show off yours! If you’re game, please email your photo to traci (at) gobigorgohomeblog (dot) com. We’ll only use your first name, if you want, or we’ll give you full credit and link to your blog, if you have one. Thanks! See more images at the Photo Friday link-up on DeliciousBaby.com! A BIG thanks to everyone who entered our two “stocking stuffer” giveaways! Special “props” to those of you who spilled your guts and told us who you’re least looking forward to seeing over the holidays. There now, don’t you feel better? I know I will…on December 26th. I used Randomized.com to select the winners. Megan won the $50 Gift Certificate for Appalachian Outdoors, and Kerry won the BTB Sunglasses! Thanks again, and stay tuned for more giveaways in the new year! Okay, so I’m off topic. No BIG stuff to talk about today, other than huge amounts of pre-holiday stress. I’ll be wearing a harried, slightly crazed, Calgon-can’t-even-begin-to-touch-this look on my face until December 26th. Get used to it. But I did want to spread some holiday cheer with “Go BIG” readers…with some fun giveaways which are great stocking stuffers. Read on, and enter below to possibly win one! Chiming In to Announce our Anniversary Giveaway Winner! We’re excited to announce the winner of first anniversary giveaway prize! There were three ways to enter this contest. Our winner, Elizabeth F., entered by posting a photo of a BIG attraction she’s seen. 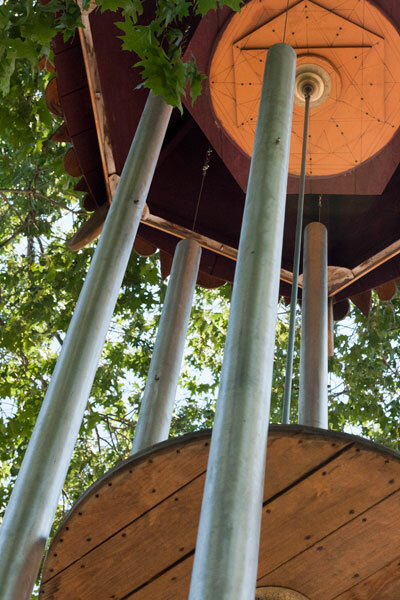 (the world’s largest wind chimes in Eureka Springs, Arkansas) on our Facebook page. Read more about her adventure here. Congratulations, Elizabeth! You’ve won two pre-paid Go City Cards for the city of your choice, courtesy of Smart Destinations! I just had to look up more info on the wind chimes! Technically holding the record as the World’s Largest Tuned Musical Wind Chimes, they’re located outside of Celestial Windz Harmonic Bizaar, an art gallery and store. The chimes weigh 782 pounds, and the longest one is nearly 36 feet long! Elizabeth's photo of the BIG chimes! Love it! Thanks again to Smart Destinations for donating the prize for this travel giveaway! Speaking of travel, if you’re headed to Florida or Vermont anytime soon, please check out my recent guest posts on some of my favorite family travel blogs, which provide information on Clearwater Beach, FL (TheVacationGals.com) and Burlington, VT (FamilyVacationCritic.com).